1971 Pontiac GTOs. Lot 55 of 58. CLICK-> Polo Green 1971 LeMans Sport convertible, right front view. We have this one in two additional sizes; 800-600 wallpaper and 1024-768 wallpaper. CLICK-> Here's a picture of the restoration on Scott Sands' 1971 LeMans Sport convertible. This restoration was performed in the summer of 2004. The car was originally red. CLICK-> 1971 LeMans Sport convertible undergoing a restoration, top side rear view. CLICK-> The front fenders, bumper, and hood were removed. CLICK-> Black 1971 GTO owned by Michael Abate. Michael just finished a seven year restoration on this Goat. This was our Picture Of The Week for 8/7/05. Click here to see more pictures of this car using the Advanced Picture Searcher loaded with model=GTO, year=1971, and owner=Michael Abate. 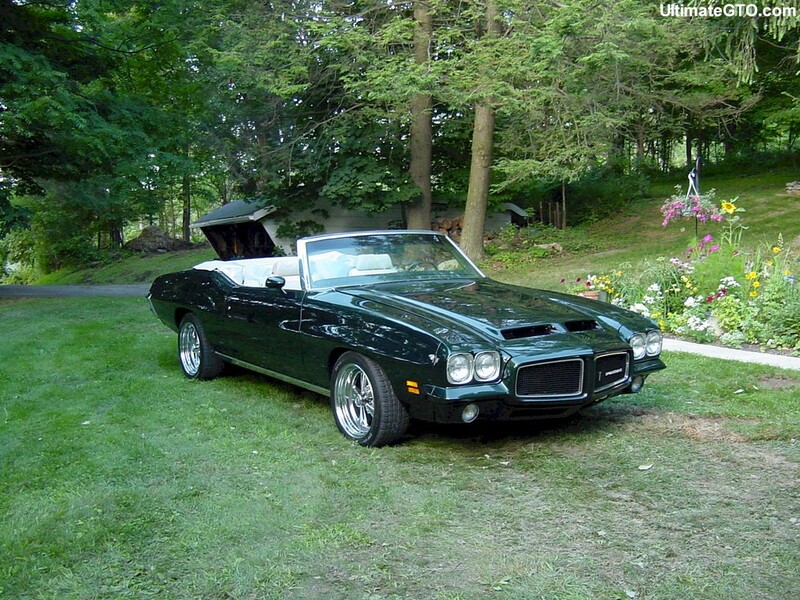 CLICK-> Blue 1971 GTO convertible owned by Dan Cormier from Kingston, Ontario, Canada. This was our Picture Of The Week for 2/5/06. He is taking off for the Woodward Dream Cruise 2005. This is what GTOs are all about - driving them to enjoy. Even better, going to an event or show for others to enjoy looking at and learning about. Dan tells this story, "This is another GTO saved from the salvage yard. I bought the car 15 years ago when I was at a university. The car was in bad shape. However, being a student, it's all I could afford. The car looked good from far but far from good! I drove the car for a few years then stored it until I could afford to restore the car. Seven years ago, I started the frame-off restoration. Slowly but surely, I began to search for the broken and/or missing parts for the car. Best of all I meet people with common interests and made friends along the way. It's been a long seven years but it was worth it! The only person happier than me that the car is finshed is my local gas station owner! Happy motoring!" CLICK-> Blue 1971 GTO convertible, left front view. CLICK-> Blue 1971 GTO convertible, front end view. CLICK-> Blue 1971 GTO convertible, left side view. CLICK-> Dan sends in more pictures of his Blue 1971 GTO convertible taken in the summer of 2006. The car is parked in front of the main entrance of Ontario Hall at 67 University Avenue. CLICK-> Front end shot of Dan's blue 1971 GTO convertible parked at Queen's University in Kingston, Ontario, Canada. Hey! He's parking on the sidewalk! Ontario Hall is on the left. Grant hall is in the background. CLICK-> Blue 1971 GTO convertible, right rear view. Ellis Hall and Richardson Hall are in the background on the campus of Queen's University. CLICK-> Castillian Bronze 1971 GTO hardtop owned by Edward Nedrow from New Kensington, Pennsylvania. This was our Picture Of The Week for 8-5-07. Edward has this story to share, "I've waited for 30 years to get a real GTO and I got it in 2002. It's a numbers matching GTO. I got it in Pennsylvania where I live. I'm a Grand Prix man. I love Pontiacs, my first car was a 65 Bonneville 2-door 389. This GTO has 400, 4 bbl, auto, 3.08 posi, and 53,879 original miles. Now that I got one, all my High School buddies want it - sorry they got married instead. Not me, Pontiac GTOs are like fine wine - they get better every year." CLICK-> Castillian Bronze 1971 GTO hardtop, right front view. Says Kevin (KevinGesche. @aol.com) - "Thanks, I (..used your GTO For Sale list and..) found a '66 GTO convertible in Connecticut and purchased it today [my birthday]."